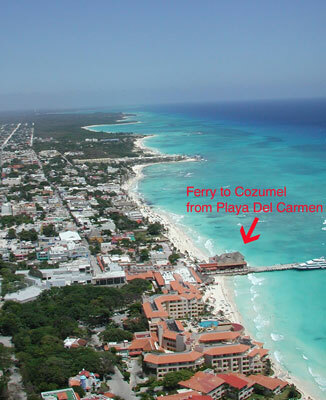 The only ferry dock to Cozumel is in Playa del Carmen located on Calle 1 Sur which is east of 5th Avenue and about a 10 minute walk from the ADO bus terminal on 5th. It’s a comfortable 30 minute trip providing all the proper amenities; air, refreshments (including beer, of course) and snacks. The ferry is modern and large so it rarely reaches full capacity. Generally the ferry leaves every hour, on the hour, but always check because times are subject to change, especially in poor weather conditions. The first ferry out of Playa is 5am and the last is 10pm. From Cozumel, the first departure is 6am and the last is 11pm. Along 5th Avenue you can find numerous booths selling tickets as well as the one at the ferry dock. The cost is 156 pesos one way. Although there are two different companies competing for sales they are a mirror image of each other. Both leave at the same locations, at the same times and for the same price. Looking to rent a short term rental or vacation rental in Cozumel Mexico? Visit CheapCancunRentals.com for hundreds of affordable properties to rent.